A Beautiful 2 Tone ring wiith a .5ct Diamond. The ring is from the Boyne Collection and is a fantastic representation of the River of Life. The Ring is painstakingly crafted from Yellow and White 14 Karat Gold which combine beautifully to give an essence of the ages and of times gone by. The ring is shipped to your door for the price quoted - all shipping and import duties are already paid - the only surprise you get is this beautiful piece of jewellery. A stunning Irish Made Ring! 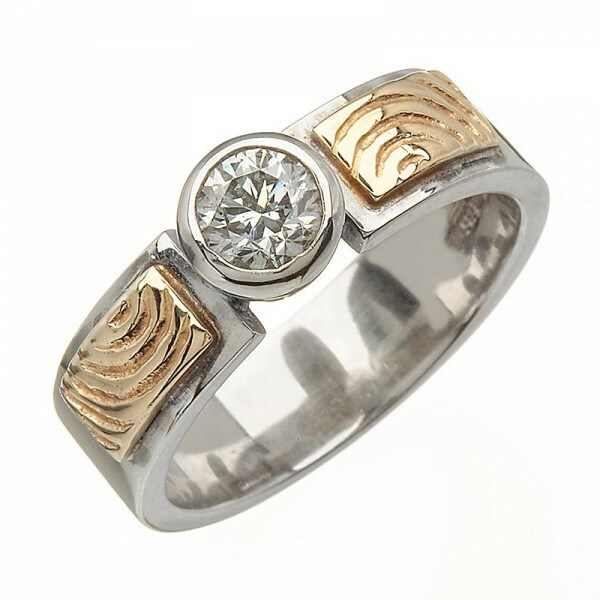 From the Boyne Diamond Collection - the lines are a symbol of the B..
A Classic Irish Wedding Ring! From the Sheelin Collection - the Intertwining Knots are a symb..
A Classic Irish Wedding Ring!From the An Rí Collection - it symbolises the Journey of Life and celeb..